looks like someone bought the P-tips off it, and is being relisted with bi-props. good score for someone on those props! All in all not too bad of a plane. Certainly I'd absolutely work on a few things before it left the ground with me in it, least of which is install de-comp valves. Especially with a fresh rebuild, the compression would be very high and therefore hard to pull, but hey, that's just me. Secondly, the Tedlar needs work where the tape is slipping, and one thing I'd personally do is replace the struts with slightly longer ones to create some dihedral in the wings. 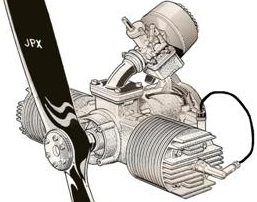 I'd then change the throttle cable routing from the current bolted positon where the prop spinner should be. The rest of the things I can see are all cosmetic or just some upgrades like different props and add spinners, large control rods, wheel pants, reroute brake cables, replace the plug cap with new NGK resistor cap and safety wire, and a few other little things. Really though, as Tyler mentioned, it seems like a good plane for someone. This is another plane (Series II wide gear). The one below (Series III) sold the other day.